Non-GMO white hylum soybeans have a light colored hylum, which in regular soybeans is dark colored. The hylum is the scar on the seed marking the point of attachment to its seed vessel. If you make soymilk or tofu with regular soybeans you may get a darker colored product, especially in tofu. 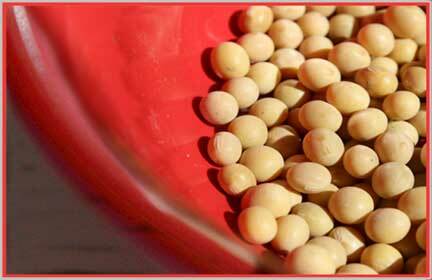 Most prefer to have the normal whitish product, thus they prefer the white hylum soybean. The other consideration is that these are Non-GMO. Dry soybeans are harvested when fully mature and dry. Green soybeans are harvested just prior to maturity, when they look something like green peas. 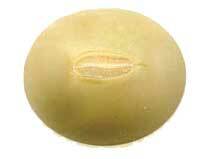 Green soybeans are tasty and may be eaten as a side dish or snack, in salads and soups, or with other food ingredients. We don't harvest or process green soybeans. To cook, put soaked beans in a large pot. Add 6 cups of fresh water for each pound of beans and bring to a boil, allowing steam to escape. Do not salt. Reduce heat and simmer for about three hours, until beans are tender. Season soybeans with your favorite herbs. For small orders, use our online order form, soybeans are listed after the popcorn cases. For those wanting a large quantity (more than 100 pounds), here is some information which hopefully can reduce shipping costs. Shipping costs depend on different factors which we are not expert. Distance to ship is one, your location (in the U.S.) is another, distance from a terminal is important, as is whether you have a business facility or residential, a forklift and dock, or not. See our Shipping via LTL Carrier page. We ship box orders via Flat Rate USPS.